This is the rigid version of the 50/3.5 collapsible for the Nikon One. Apparently both lenses share the same four element optical formula. Many experienced Nikon collectors are not aware of this particular lens, since the 50/3.5 Rigid is not listed in the Rotoloni Nikon Rangefinder book -- since it was not made in Nikon RF mount. 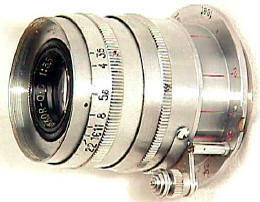 The 50/3.5 Nikkor was one of the original lens options for the early 1950's Nicca cameras, excellent Leica copies similar to the Leica III. The 50/3.5 rigid was also sold with Tower cameras, which were really Niccas with a Tower nameplate sold through the American Sears department stores. Contrary to popular folklore, Nicca had nothing to do with Nikon, other than buying lenses from them. In fact, Nicca is actually the great grand daddy to the Contax G2. 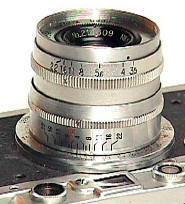 Nicca was bought out by Yashica, giving Yashica its first focal plane manufacturing facilities. Yashica/Contax makes today's G2 and AX using Zeiss lenses. Besides its unique appearance, the 50/3.5 Rigid's most interesting feature is close focusing to 18 inches, though rangefinder coupling ends at 3.5 feet. Apparently this lens was made only in chrome barrel Leica screw mount, with no black rigids or other mounts presently known. Weighing in a 7 1/2 oz, it has a 34mm filter size. Total length of lens from filter thread to back of mounting plate is 34mm, or roughly the same size as the faster 50/2 Nikkor. The f/stops range from 3.5 to 22. The focusing mount on this example is marked in feet since it was intended for the American market. Interestingly, it sported a "Nicca" lens cap, not a "Nikkor" lens cap. Randol Hooper estimates production at only 500 lenses, which translates to SIX times rarer than the fabled 50/1.1 Nikkor! !